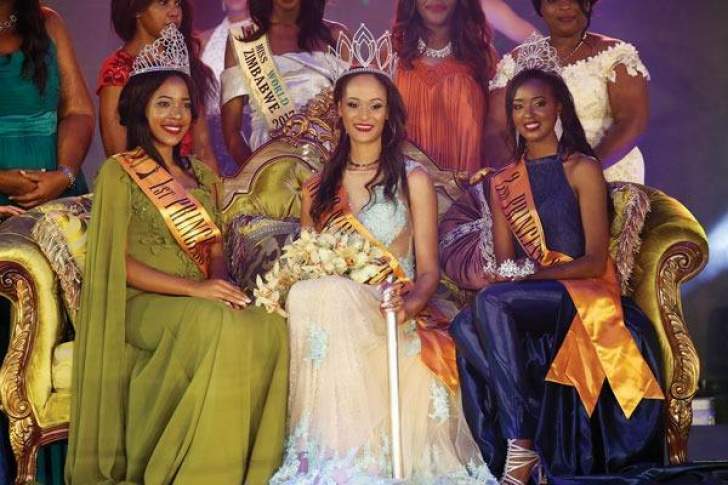 Twenty one-year-old Masvingo beauty Hajirah Belinda Potts, shrugged off competition from 13 other stunning models to be crowned Miss World Zimbabwe 2018 at a glittering ceremony held at Orchid Gardens, Domboshava, on Saturday night. Potts automatically won the ticket to represent the country at Miss World pageant to be held in China this December. The Veterinary Sciences student at Mazowe College could not believe her "luck" at being crowned the most beautiful woman in Zimbabwe. "I am so excited and firstly I would I like to acknowledge God, my family and friends for supporting me. I have just won $20 000, a car and a trip to China among other prizes. I am the queen," said Potts in an interview with The Herald Insight soon after the event. Barring any hiccups like having a brain freeze or falling on stage - it was clear from the onset that she would be among the winners as she possesses all the requisite features that make successful beauty queens; height, waist size, confidence and a killer smile. Potts will be deputised by Patricia Muchenje, the First Princess, who walked away with $15 000 and Canada-based model Kuzivakwashe Mujakachi, who scooped the Second Princess crown as well as the People's Choice Award (Miss Personality) with 16 000 votes. The three were selected by a panel of judges that comprised South Africa-based businessman Frank Buyanga, Hagga Mubaiwa, Ali Asidi, Danny Marandure and Judith Gamuchirai Gwasira The panel of judges for Miss World Zimbabwe 2018 Prizes were sponsored by Big-Time Strategic Group and ZOL, a leading internet company among others. For being the People's Choice, Mujakachi walked away with $5 000 and she also received $10 000 for being the third most beautiful model on the night, making her one of the biggest winners. "I have just finished my International Business degree in Canada. My priority now is this crown. I am so happy and shocked at the same time, landing two posts. I will be in the country until Potts leaves for Miss World in China," said Mujakachi. Potts' case to land the crown was boosted when she sailed through flawlessly during the question and answer segment. Her question; "What would you be in five years?" was one of the easiest on a night which saw some aspiring queens freeze and fail to answer some kindergarten demands like naming any three features found at the National Heroes Acre. The ever-smiling Potts said her mother was her role model. "I owe everything to my mother, she has been very supportive. I started modelling at the age of 16 hence was so privileged," she said. Though she won a brand new vehicle, a KIA Rio, Potts has no driver's licence and thus will wait a bit longer to take delivery of the automobile as she undergoes the necessary steps to get the all-important document. During the event, Miss World Zimbabwe licence holder Marry Chiwenga introduced the Miss Zimbabwe Trust executive that has been an the forefront of organising the pageant. Elegance As has become the norm, Miss World Zimbabwe beauty pageant lived up to its billing - there was glitz and glamour. Guests, who parted ways with $300 each for a seat in the venue, got value for their money, as they enjoyed a three-course meal, expensive whiskey, imported wines and other beverages. As usual, this was a black-tie event, which saw attendees arrive dressed to the nines. The event was attended by high-profile figures including the country's two Vice Presidents Constantino Chiwenga and Kembo Mohadi Zimbabweans have really embraced global trends on the fashion scene. One would be forgiven for mistaking Miss World Zimbabwe for the famous Oscar awards. It was a mixture of designer wear and tuxedos. Even ushers and security personnel donned suits. Karen Paida and Godfrey Koti hosted the show as well as manning the red carpet. Paida, a relatively new face on the showbiz scene, is already being compared to the likes of Bonang Matheba for her flawless presentation on the night. In 2016, Paida, a television and radio personality, made headlines after coming second in the TLC Next Great Presenter competition, which had 11 other contestants from across Africa. Tendai Dembo stole the limelight as he performed his father's greatest hits. Dembo had the crowd eating from his palm as they danced the night away. Just his mere presence at the event was both symbolic and historic as it invoked memories of Miss World 1996. One of his late father's greatest hits, "Chitekete", was played at that pageant, which was held in Namibia. Although live performances are not his forte, Zimdancehall star Killer T performed his hits with a live band. He had to be called back on stage for an encore. Most importantly, the whole soundtrack to the glitzy event was local music, which marks a departure from other events' obsession with all things foreign.